Twitter is another name for the internet traffic superhighway. Its 302-million-plus active users are hungry for information, and love to click on links that fascinate them. 500 million Tweets are sent per day and 80% of Twitter active users are on mobile. If you just started using Twitter or have been using it for some time, and it seems like a deserted place to you, read on, because you are going to learn about some simple and free tools that help you attract more followers with each one of your tweets. Also, I want to remind you about the importance of tweeting smart. Your tweets should be catchy and timely. Composing interesting tweets is largely a subjective matter and depends upon the audience and their choices. If you are doing everything you can to make your tweets interesting, the timings of your tweets are the second most important factor. There’s no use tweeting at a time when none of your followers are online. The third most important thing is the frequency of tweeting. All your followers cannot be online at the same time. You should try to achieve a balance between letting every one of your followers see your tweets without flooding the stream. Remember to follow people who are influential in your particular subject. Interact and engage with other users. Learn from other people’s tweets and observe the kind of stuff they are sharing. Once you are doing these basics right, you’ll be able to make the best use of the following free tools to supercharge your Twitter marketing. You might have heard of this one. 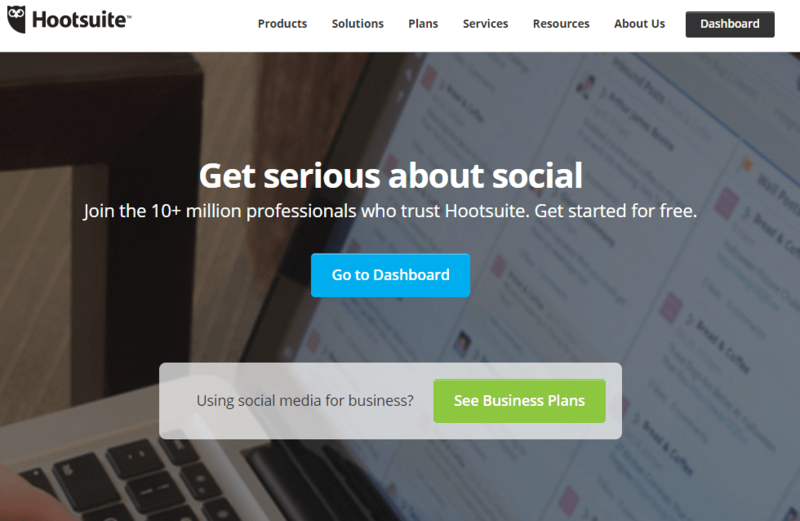 HootSuite lets you manage up to five social media profiles for free. The profiles can be added from Facebook, Twitter and Google+. HootSuite has a pretty elaborate dashboard with multiple displays. When you add your Twitter profile, for instance, the interface shows you four separate feeds. You can select from 8 different streams including home-feed, mentions, direct messages (inbox and outbox), sent tweets, favorite tweets, retweeted tweets, and scheduled tweets. Apart from accessing four different streams, HootSuite also lets you schedule tweets in one go, so that you don’t have to login to your Twitter profile every time you want to send an update. If you have an idea about the best timings to tweet, you can use HootSuite to schedule tweets on those timings. Also, it supports up to 35 popular social networks. I use HootSuite PRO. Try it for free and set up to 100 social profiles, up to 10 enhanced analytics reports and up to 10 team members. HootSuite allows you to manage multiple social media profiles including Twitter, but it is not exclusively for Twitter. You can access Twitter activity via 4 screens and manage your profile better, maximizing exposure. The downsides are that you still don’t have a clue about the geographical location of your followers and the time when most of them are online. Buffer is the mobile and desktop app that is proven to get 200% more clicks, reach and retweets on your tweets. Although similar to HootSuite, Buffer is much easier to use, and of course, free. You can sign in using your Twitter account, but you can also include your Facebook, LinkedIn and AppNet profiles and pages. Buffer also gives you the option to install a browser plug-in using which you can share anything on the web to your Buffer while browsing. When you add a tweet, it goes into your “buffer” and is retweeted multiple times, depending upon the schedule that you set. Buffer is a delightful app for managing your Twitter and other social media accounts. Simple to use, you can even install it on you mobile and be on top of Twitter all the time. The downsides are that you still have to figure out the best timings to tweet. The free buffer account also puts a restriction on the maximum number of tweets that you can put into your buffer. Of course, you can “go awesome” any time by subscribing to the paid service, which lets you add up to 12 social media channels and limitless tweets to your buffer. Tweroid is still pretty basic in terms of the algorithms it uses and the variables it takes into account when analyzing the best times for you to tweet. Tweroid is another free service that you can join just by signing in with your Twitter account. It takes a couple of hours or more to analyze your profile, depending upon the number of followers you have. Tweroid analyzes your tweets as well as those of your followers in order to calculate the best times to tweet for you. It includes up to 1000 of your followers, so the results are more accurate. Tweroid also filters out non-humans (bots) that might be following you on Twitter, so the results are more focused. The not-so-strong side is scheduling and geographical targeting, for which you have to rely on other tools. TweepsMap is a fantastic free tool that helps you do just what it says: map your followers. Just sign in using your twitter account, and wham! You have a comprehensive map showing your followers’ locations right before you. The app is pretty amazing if you want to have an idea where your followers are located. The information can be used for optimizing your tweets in terms of timings and effectiveness. The downside is that you need to use this tool in combination with other tools to get the best results. Twitter is my favorite social media for increasing my audience and market my blog content. What are your favorite Twitter tools? Yes, I am all in for HootSuite and Buffer too, but as I don’t have many accounts, the free versions does well enough. You are right about the one problem about the best time to tweet, though for most of us who have our fans and followers from all over the globe, I guess tweeting all the time through these tools makes sense! I love Triberr and JustRetweet too – don’t take much time and helps reach a wider audience too. I hadn’t heard of TweepMaps, and I am sure I’d see tweets showing from all over if I use this app…lol.. Checking TweepMaps, I found out that most of my followers are from U.S. So I guess that tweeting a certain time of the day, will give the best results. Wow Eric, I’m caught by TweetMap. While I have used a couple of them on your list, I think TweetMap is something excellent I’ll have to try out this moment. Glad you liked the post, it’s good to know several Twitter tools to use, right? Give it a try, it’s free. Have a productive week, mate. Excellent post. I am a little new to the whole blogging industry but I have found my most success in using Twitter. I’m from the USA but a lot of my traffic is worldwide so it’s very hard for me to reach all of my followers with my tweets each day. Tools like Hootsuite and Buffer are fantastic to give you the ability to tweet even when you are asleep! But I really like hashtags in my tweets, as it allows you to reach a global audience instead of just your followers. As a new blogger I obviously don’t have thousand of followers, but when I time my tweet perfect and use the right hashtags, I hit a home run. Without Twitter I would be stuck in the sand as a blogger. Once again excellent tips and looking forward to reading more of your work! Twitter is my favorite social media for building new followers, increasing my audience and marketing my content. Did you read the other posts I mentioned in this article? I love this post. Twitter is also a tool I like so much and I use Justretweet as well to support twitter. The tools you have mentioned are great especially Hootsuite which I was using before but decided to leave for sometime to test other alternatives. I use HootSuite PRO, great for managing multiple accounts under the same dashboard. I love also the RSS feeds feature. I know some of them, such as Hootsuite and Buffer. but, I never heard another tools yet. And I am happy to know them here. I save this link to see it again later on. Have a nice day for you! that’s good to test new ones, from time to time. Twitter is my favorite social media channel for marketing! Hey, bro… how are you doing today..? I hope you are doing well. Well, today I have visited some blog and I found you comment over there. You blog title was really impressed to me because I’m currently looking for some tools that help me to explore more present on Twitter. Thanks for sharing, the list all above are really nice tool for social media marketing such as Twitter. Honestly, I used to use Hootsuite social media tool. It was really amazing tool that allow me to work faster own social media, I could save a lot of time work on various platform. What the most I love about Hootsuite is that I could share up to 40 social media network with just single click. But I budget is limited I quite hootuite, and move to Buffer. Also, it is one of really tool. I could schedule my post, and traffic numbers users who click on my links. everything is going great, thanks! So you found this post from my comment around blogosphere? The basic plan at HootSuite PRO is quite accessible, just $9,99. It saves me a lot of time daily, so for me the ROI is high! Thanks for visiting and sharing your views, Kim. Looking to hearing back from you. Hi Erik,Nice list of twitter tools. I am a huge fan of viralcontentbuzz. It absolutely wants nothing in return for the valuable shares. A bit sharing by yourself is necessary but that us so easy there. What makes it better than justretweet is it focuses on all round social shares not only on twitter. I’m a big fan of ViralContentBuzz too! I use JustRetweet too, to increase my audience and the shares of my content. Thanks for your kind feedback, Bilal. Nice list of twitter tools. I use viralcontentbuzz and justretweet for more twitter share and traffic. As per my experience viralcontentbuzz works much better than justretweet. ViralContentBuzz is more focused on quality of tweets and users. I am agree with you on hoot-suit or Buffer both are amazing platform where we can schedule post and can publish our post on a specific time. Thanks so much for this share..
good to read you’re using these tools too. Well I rarely use twitter and I never tried any of the listed tools and I’m intrigued to learn about features of these tools. Well, you should start using Twitter more often! It’s my favorite social media marketing tool! Great resources and twitter tools, ViralContentBuzz is one of the amazing tool among all the listed ones. Thanks for compling all the twitter tools at one place. Wow. What a great post! I love to read this post. And i think this will help to exposure myself on twitter. You all above tips was good to me and it will of course help others to exposure them self. You always bring any helpful, quality, and needful post. Thank you for sharing this post with us. Thanks for being a loyal follower and reader, Romjan. Out of 4 tools, 2 of them I’m using it and it helps me in most effective way of my post reach to audience. Tweroid and Tweets map i;m hearing it now. Let me try and see how well it works for me. I know that one tool will be superior to other. Do you prefer which the best amongst 4 and how well it working for you at ? I use the PRO version, to manage all my social media accounts, under the same dashboard. If you are a serious internet marketer, you need it. Hi Erik, These are handy tools for managing twitter account, I am using buffer right now. It is very useful for me as we can schedule the post in it and add other social media accounts in it. I have not started to track down the followers yet. Now I have a tool to do so. I will start to keep tracking the right time to post when most of the followers are online. glad you found some new useful tools to use in this post. An impressive and interesting information about Twitter. I use Twitter Analytics and get a lot of information easily. Hootsuite lets me schedule posts, although not nearly as easily as Jukebox seems to – and it has an the added benefit of choice of retweet. What does it use for a link shortener? If it’s Owly, I can combine efforts and get analytics from both platforms. Lastly – so glad to see a hashtag research tool – RiteTag looks wonderful, too. Thanks for more great information! Thanks for shared and great effort or enjoyed to reading this article. thanks for sharing your views on those tools. I’m using all of these and I think people underestimate the power of Twitter lists. I use them to generate Paper. It’s based on specific topics and related content. Have you tried CrowdBooster yet? That’s a great one for building exposure too. thanks for mentioning that tool. I need to check it out. I really appreciate your visit and suggestion! Hi Erik, Justretweet is useful to get tweet shares only, if you want to increase twitter followers use unfollower sites and then follow someones followers in the same niche. My suggestion is keep your tweets always clean, it should be your own site tweets so people will get interested with you. Othewise know about different kind of tools of Twitter and used tools in further its benefits for me or not. Manageflitter is great to follow/unfollow Twitter users. I love Justretweet, it’s used by many popular bloggers! Different kind of tools of Twitter which are really helpful for increase of traffic, thank for shared and these kinds of tools really boost of ranking in initial stage. I’ve been trying to increase my twitter stats and conversions but it isn’t happening right now! So, I guess your guide might help me get out of this pitfall. Thanks for the kind feedback, Christ.